Bruree National School Parents Association held a very successful Rambling House at Bruree National School on last Friday night. 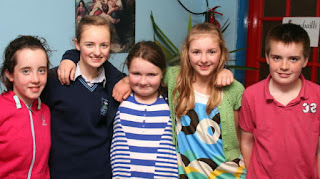 The talent on display both local and visiting was outstanding and everyone is to be congratulated on their performance. Winners of last week’s 45 Drive were Mary Noonan and Evelyn Byrnes with ten games. Runners up were Anne Potter and Eddie O’Dea with nine games. Raffle prizes went to Eddie O’Dea, Joe Carey, Katherine O’Regan and Mary Margaret Noonan. The 45 Drive continues in the Community Centre every Tuesday night, starting at 8.30 pm sharp. Mildred O’Dea would once again like to thank everybody who donated so generously to her recent coffee morning in aid of Daffodil Day. Some more donations have come in making the final collected €750. 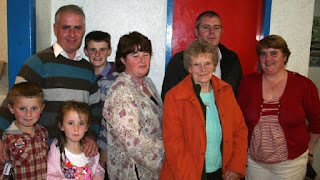 We extend our sincere sympathy to the family, relatives and friends of Mary Herlihy, Waterford and late of Clogher, and Nora Moloney, Doon, who died recently. The Under 14 footballers had a big win over Feohanagh/Castlemahon in Coolyroe. Top scorers for Bruree were Gearoid McCarthy, Terence Galvin Buckley, Aaron Fitzgerald and Sean Quirke. Others to shine on the day were Dara O Driscoll, Brian Sexton and Sean McCarthy. The Under 16 hurlers had a hard fought two point victory over Fedamore in Fedamore. Bruree trailed by the same margin at half time but they showed great determination in seeing off a stiff challenge in the second half. Patrick Carey, Terence Galvin Buckley and Darren Kelly were strong throughout for Bruree. Bruree U13 Hurling versus Kilteely-Dromkeen in Bruree on Wednesday May 4. Our Under 13 hurlers continued their impressive run of form on Wednesday evening last against Kilteely-Dromkeen. The first half of this game was very competitive and Bruree struggled to get into their stride against a determined Kilteely outfit. At half time Bruree led by four points to two, however on the resumption, Bruree upped their collective performance and started to dominate their exchanges around the field. Shane Hannon was making life difficult for the Kilteely defence at full forward and scored a great goal to settle Bruree’s nerves. From that point onwards Bruree really grew in confidence. A highlight of the game was the first touch displayed and the great teamwork which is a hallmark of this team this year. Daire O’ Driscoll was earmarked to do a man marking job in the second half and he put in an excellent performance when he moved to midfield. Edward Moore really came into his own in the half back line during the second half. Brian McCarthy, who was introduced in the second half, marked his first game at this age group with a well taken goal. David O’ Connell again dominated at full back. Tommy Cronnolly and Gearoid McCarthy covered every blade of grass and linked the play very well. Sean Quirke showed some great form from placed balls and was a constant threat in front of goal. The goalkeeping duties were ably shared between Jonathan Fitzpatrick and Ciaran Sexton. Brian Sexton worked very hard throughout at half back with Jack Murphy backing him up in the corner. Cathal Barrington again continues to show great touches at corner forward. We will be playing Kilteely/Dromkeen again, this time in football, in our next game on May 18. Lucky dip winners in last week's Bruree GAA/Rockhill Rovers lotto were €50 Mike McGrath €25 Bill and Kathleen Kiely, Breda O’Donnell, Tankardstown €20 Pat Murphy, Sandra Keogh, Ballyhea, John O’Regan, Bruree. The Pat Potter Memorial singles is on at Dundrum Golf Club on Saturday, May 21st. Names and money to be with the committee by Wednesday May 18th. The Bruree team of Ger Mullane, Mark Cagney, Catriona White, Mike Potter, Rosalyn Mooney, Joe Carroll, Danny Deady, Frank Finn, Mike Sexton and David Deady had a 4-1 win over Whelan’s bar, Newcastle West at Newcastle West Golf Club. The team manager is Kieran Allen and he and the team panel are to be congratulated.